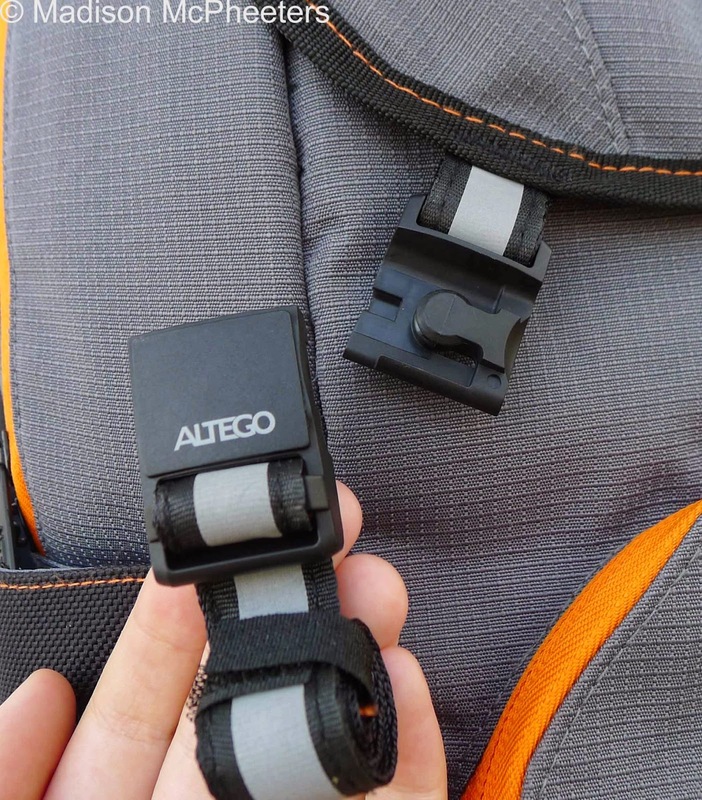 Last year, I reviewed an eye-catching new laptop messenger bag from a company called Altego. This bag, featuring twist-to-lock buckles and a cool blue-on-black color scheme, had lot of unique features and style. This summer, Altego released a new line of bags, the Polygon series, that looks just as promising. 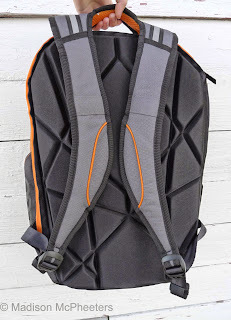 Today, I’m reviewing the 17” Polygon Sunfire backpack. It also features unique buckles, a bright color scheme, and durable fabric. Click read more for my full review! Let’s take a tour of this backpack. We’ll start with the exterior. The Polygon Sunfire has a sporty, eye-popping color scheme and an edgy, modern style. Zipper trim is a dazzling shade of bright orange and the water resistant exterior fabric is grey. The Surefire’s fabric is extremely durable and tough. You could probably cut at it with a kitchen knife and not damage it. On the front of the backpack, there is a zippered compartment that has two phone-sized pockets and two pockets for individual pens or pencils. This interior fabric has a glossy, satin finish. Two small pockets are on the sides of the backpack. These are covered up by the front flap straps when closed. Next, there is a zippered shallow pocket on the front flap. In case you haven’t noticed, there are a lot of zippers on the Polygon! On the three largest compartments, there are two zipper pulls. They all operate smoothly and have long, Altego-branded metal zipper pulls. Two adjustable straps with Fidlock buckles keep the front flap closed. Reflective ribbon here and on the shoulder straps gives added visibility at night. Though I admit that I was skeptical about the Fidlock buckles, I quickly changed my mind. These buckles consistently work well. To open, slide the top piece off to the left. Hold one piece near the other to close them magnetically. It’s simple to do, even one-handed. Next, let’s look at the roomy interior compartment. Two long pockets are on one side of the main compartment. There is a variety of pockets on the other side. A thick, orange plaid-lined iPad pocket is flanked by two pairs of pencil pockets. Behind the iPad pocket, there’s a large zippered pocket for papers or miscellaneous items. Now, let’s flip the backpack over and look at the other side. Thick half-inch foam on the exterior covers up the 17 in laptop compartment. The interior, well cushioned all around, is lined with soft orange plaid fabric. An additional layer of thick foam on the outside provides extra protection. This half-inch thick padding has polygon shapes cut into it. With all sorts of pockets and spaces to fill up, the Sunfire can get heavy fast. 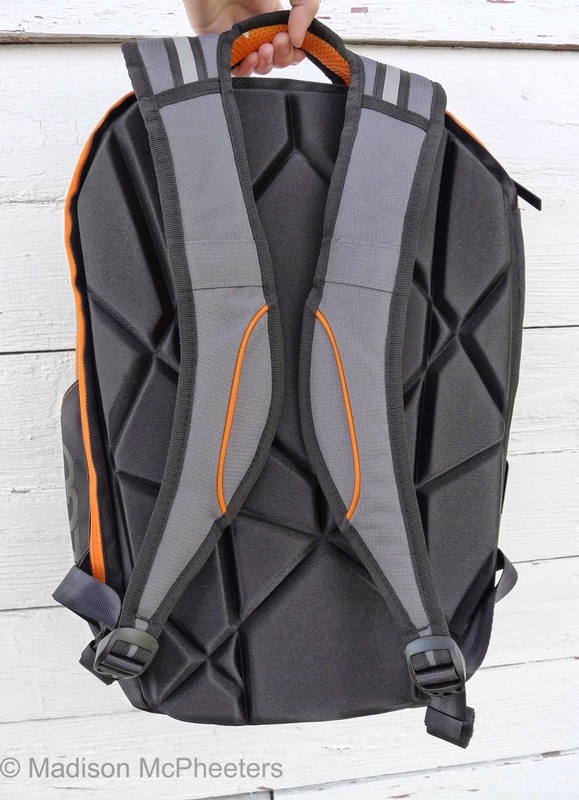 Luckily, the shoulder straps are well padded, adjustable, and comfortable. Even here, there is plenty of attention to aesthetic detail. The underside of the straps are bright orange, and there are orange accents on the outside. If you are looking for a large backpack that has style, durability, and protection for your tech, the Altego Sunfire is a great choice.